This is the documentation of the Exakat engine, version 1.7.5 (Build 911), on Mon, 15 Apr 2019 17:22:08 +0000. Exakat is a tool for analyzing, reporting and assessing PHP code source efficiently and systematically. 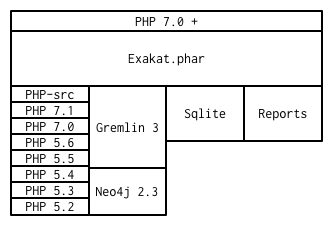 Exakat processes PHP 5.2 to 7.4 code, as well as reporting on security, performance, code quality, migration. Exakat reads the code, builds an AST and several dependency graphs, then indexes all of it in a graph database. From there, exakat runs analysis, collecting potential errors and descriptive information about the code. Finally, exakat produces reports, both for humans and machines. Exakat detects hundreds of issues in PHP code : dead code, incompatible calls, undefined calls, illogical expressions, etc. Exakat is built for PHP, and cover common mistakes. Every PHP middle version is a migration by itself : based on the manual and common practices, exakat find both backward incompatibilities, that prevent migration, and new features, that makes code modern. Exakat review code for minor version, and spot bug fixes that may impact the code. Common best practices and recommendations for specific plat-forms like Wordpress, CakePHP or Zend Framework are covered. Exakat detects several specialized analyzes, for Web security : making the code more secure online; PHP performances : allowing faster execution. Exakat has several specialized analyzes, for Web security : making the code more secure online; PHP performances : allowing faster execution; Testability : targeting the common pitfalls that makes code less testable. When auditing code, it is important to have a global view. Exakat collects all PHP features (magic functions, any operator, special functions or patterns) and represents them in one report, giving auditors a full view. Exakat inventories all literals for later review, helping with the magic number syndrome and any data refactoring. Automated coding standard violation detection for PHP review the code for syntax layout. Exakat is not a coding standard detection tool, as it focuses on bug finding, rather than coding layout. While checking for coding standard, some bugs may be detected, and when checking for bugs, some coding standards may be found too. Using AST, dependency graphs and knowledge databases, Exakat reviews the code, checks its potential usage and mis-usage. Exakat doesn’t take any presentation nor comments into accounts : only functions, variables and their effects. PHP code quality checks, based on type compatibility, and structure definitions. Exakat shares AST style analysis but it goes a bit further by including common mistakes and actual PHP features detections. Code review for PHP 5 to migrate to PHP 7. Exakat covers every middle version from PHP 5.3 to PHP 7.3. Continuous integration and code quality management check the code by running code quality tools and collecting all the reported informations. Exakat is a good companion for those tools. Exakat provides machine readable format reports, such as json, xml, text that may be consumed by CI. Exakat provides also human readable format, such as HTML, for interactive review of the reports, and a longer usage life span. Exakat is an Open Source tool. The code is available on Github.com/exakat/exakat, as Docker image and Vagrant file. It is also available as a phar download. Exakat cloud is a SaaS platform, offering exakat audits on code, anytime, at reduced cost. Exakat SAS is a Service company, providing consulting and training services around automated analysis and code quality for PHP. Exakat relies on PHP to lint and tokenize the target code; a graph database to process the AST and the tokens; a SQLITE 3 database to store the results and produce the various reports. Exakat itself runs on PHP 7.2, with a short selection of extensions. It is tested with PHP 7.0 and 7.3. Source code is imported into exakat using VCS client, like git, SVN, mercurial, tar, zip, bz2 or even symlink. Only reading access is actually required : the code is never modified in any way. At least one version of PHP have to be used, and it may be the same running Exakat. Only one version is used for analysis and it may be different from the running PHP version. For example, exakat may run with PHP 7.2 but audit code with PHP 5.6. Extra versions of PHP are used to provide compilations reports. PHP middle versions may be configured separately. Minor versions are not important, except for edge cases. The gremlin server is used to query the source code. Once analyzes are all finished, the results are dumped into a SQLITE database and the graph may be removed. Reports are build from the SQLITE database.